It’s a brave new world for the Sims as they go where they have never gone before – into the future and back. Well, if you don't include the time machine included in a previous expansion. 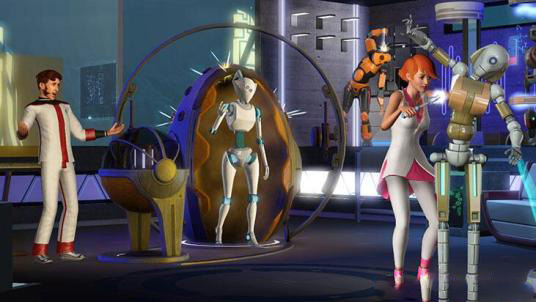 In The Sims 3: Into the Future, Sims can transport themselves hundreds of years forward where they can explore the world of tomorrow, meet their descendants, master the technology of the future, like hoverboards, jetpacks and food synthesizers and more. Have your fun, but be prepared for the consequences. Your Sims actions in the present will have surprising effects on the future. Also revealed today, was The Sims 3 Movie Stuff pack. With The Sims 3 Movie Stuffpack, you can be inspired to tell all-new stories inspired by iconic movie genres like Western, Comic Book Blockbuster and Creepy Features. What story will you tell with the movie making stuff?